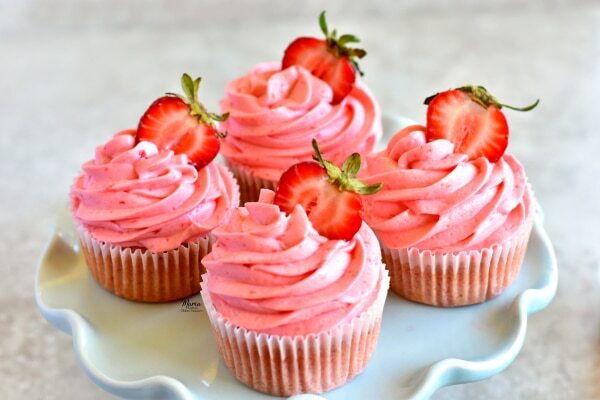 Fresh gluten-free strawberry cupcakes with strawberry buttercream frosting. 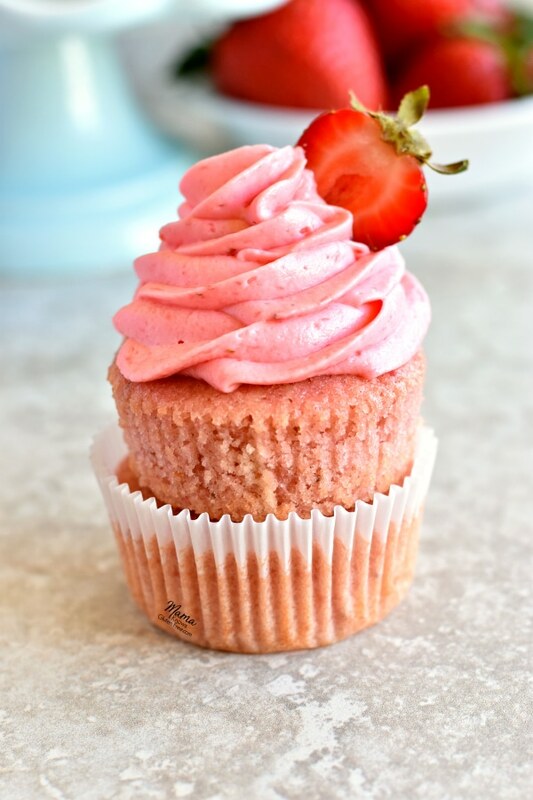 Moist and tender strawberry cupcakes topped with strawberry buttercream. No artificial colors or flavors, just fresh strawberries in every bite. With a dairy-free option. It’s just about summer-time here in North Florida and strawberries are in an abundance. I love baking with fresh berries this time of year! I first made these cupcakes last year for my daughter’s 12th birthday party. My daughter loves the color pink and her party theme was, pink of course, so I knew I wanted to make her strawberry cupcakes. These cupcakes are made with fresh strawberries, not like the strawberry cake mixes you find in the store. They are moist and tender and made with real ingredients. No artificial colors or flavors, just fresh strawberries in every bite. Don’t be intimated by using fresh strawberries in your baking. You can see just how easy if it to bake with fresh strawberries in the steps below. Once you’ve creamed your butter and sugar together until its nice and fluffy add in your pure vanilla extract. Pour the dry ingredients into the creamed butter and egg mixture and mix until fully combined. At this point, it will start to look like traditional cake batter. If you don’t have buttermilk you can make your own by adding 1 tablespoon of white vinegar (or lemon juice) to the milk and letting it sit for a few minutes. That’s what I always do. I like to line my muffin pans with cupcake liners, but you can also use gluten-free cooking spray too. 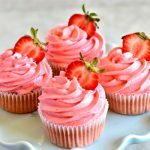 These gluten-free Strawberry Cupcakes are topped with the prettiest Strawberry Buttercream Frosting. The frosting is also made with pureed strawberries. 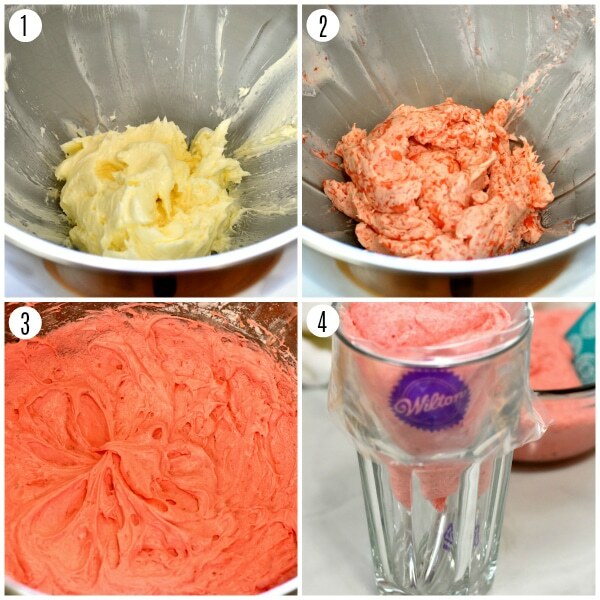 Making homemade frosting is so easy! Once you make your own, you’ll never go back to store-bought again. I use my Kitchen-Aid mixer to make the frosting, but you can use a hand mixer with a large bowl too. 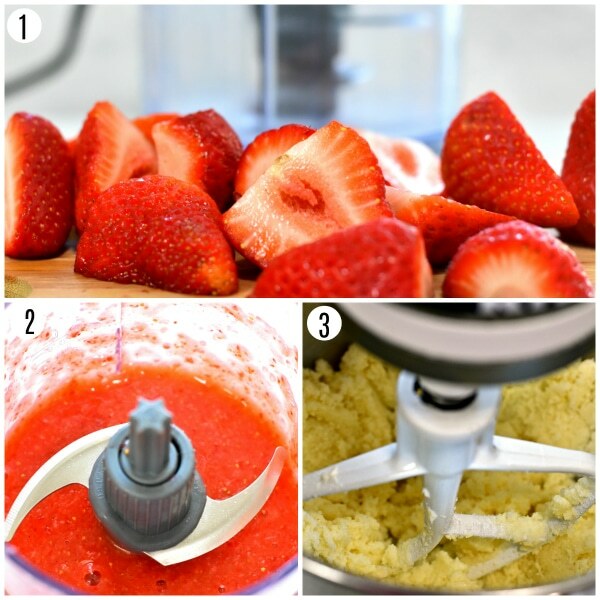 Start by adding 1/4 cup of the strawberry puree to the butter and mix until it’s fully combined. Also, add the pure vanilla extract and lemon juice at this time. If you want to have smoother frosting and be a little fancier, you can shift your powdered sugar. I only do this for special occasions, like Birthday parties. I live in Florida, so I always refrigerate the frosting before I pipe it on the cupcakes. I prefer a firmer frosting. I also like to slice the remaining strawberries in half and use them to decorate the top of the cupcakes. 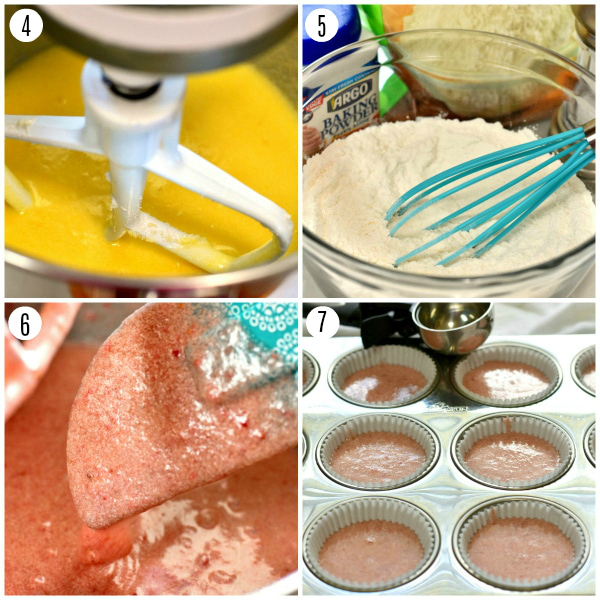 I have also included a dairy-free option to my gluten-free strawberry cupcakes recipe. My husband, my youngest son, and I are all dairy-free. I promise it is just as delicious made with the dairy-free butter and dairy-free milk. So, you too can enjoy gluten-free and dairy-free strawberry cupcakes. These gluten-free cupcakes were a hit at my daughter’s Birthday party! I promise no one will even know that they are gluten-free. Every bite is bursting with fresh strawberry flavor, making them the perfect summer cupcake. Looking for more gluten-free dessert recipes? Preheat oven to 350° F. Use cupcake liners or spray a with muffin pans with gluten-free cooking spray. In a large bowl cream butter and sugar together. Add the pure vanilla extract and mix until fully combined. Add one egg at a time to the butter mixture and mix until fully combined. In a medium bowl add the gluten-free flour, xanthan gum (leave out if your flour already has it), gluten-free baking powder and salt. Stir to combine the ingredients. Add the gluten-free flour mixture to the creamed butter mixture. Mix until fully combined. Bake cupcakes for 20 minutes. Please watch your cupcakes because all ovens are different. Use a toothpick to check and see if the centers are done. In a large bowl cream the butter using a stand-up mixer or hand a mixer. Use a spatula to scrape down the sides of the bowl before adding the next ingredients. Add the powdered sugar one cup at a time. Mix until the frosting is firm. 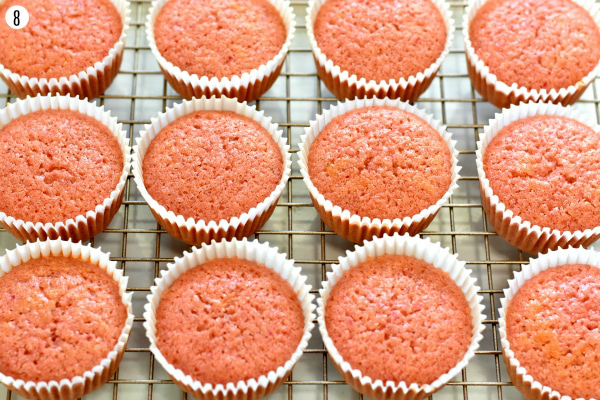 If you want a firmer frosting, refrigerate the frosting for a few minutes before either piping or spreading on top of the cupcakes. I like to line a piping bag in a tall glass and then add the frosting. It sure is less messy. My favorite frosting tip is the Wilton 1M. Cupcakes can be stored in an air-tight container, but keep the frosting refrigerated and frost cupcakes when ready to serve. I like Pillsbury gluten-free. Not all gluten-free flours are created equal. You may experience different baking results depending on the gluten-free flour blend you choose. I used cashew milk and Smart Balance butter for the dairy-free-option. I always use a greased ice cream scoop when making muffins and cupcakes. Store in an air-tight container and refrigerate. Mama says, "Always check your labels!" My teen and her friend begged me to bake and really wanted something strawberry….then I remembered this one! They loved them!! That frosting, drool!! We used Pamela’s Baking Mix, and since I was low on fresh strawberries, we we thawed some frozen and pureed those. Probably should have added a touch more flour…the frozen strawberries probably added a bit more fluid. So tender, so delicious!! Oh and they used half monk fruit for the sweetener. I am so glad that you, your daughter and her friend enjoyed the cupcakes Tessa! I’ve never tried monk fruit as a sweetener. I’ll have to give it a try. Thank you so much for the wonderful recipe rating! I was thinking about making this recipe for a gender reveal party. (Spoiler, it’s a girl). So I have two questions. What temperature and how long would I need to cook it if I made it into a layer cake instead? Also, is the cake itself very pink without any food coloring? Hi Debi! I would start at 20 minutes, just like the cupcakes, if you are baking it in an 8-inch cake pan. Test the center with a toothpick to see if it’s done. If it’s not done, allow it to continue to bake at 5-minute increments. Most cakes bake for 30 minutes. The pinkness of the cake will depend on how red your strawberries are. Congratulations on your baby girl! I hope you enjoy the strawberry cake. The cake ingredients has a dairy-free option for butter, but that’s not listed in the frosting ingredients. Can dairy-free butter be used for the frosting as well, or only real butter? Hi Sharon I use Smart Balance dairy-free butter when I make dairy-free frosting. Thanks for catching the oversight! I corrected it. I hope you enjoy the cupcakes. Can I use normal ingredients which are not gluten free instead of all the gluten free ingredients you mentioned. Hi D! I have never tried this recipe with wheat flour and I cannot have it. I only bake with gluten-free flour. Thanks for asking! Hello gorgeous I am going to make this recipe my question is you use the pilsbury gluten free flour and that’s what I have in hand also because it has a mix of things can I omit the xanthan gum or do you still use it? Also have you ever tried the recipe halved? If I follow exactly except use half of suggested measurements will the result be the same? Hi Andrea and thank you so much for your kind words! If you use the Pillsbury gluten-free you will not need to add the xanthan gum to it (it already has it in it). I have not halved the recipe but I am sure if you halved the ingredients correctly they would turn out the same. I hope you enjoy the strawberry cupcakes! Hi April! If you have allergies to palm oil and you do not have allergies/sensitivities to dairy you can use butter. I use Smart Balance butter for the dairy-free option, but I use unsalted butter for the traditional gluten-free recipe. I hope you enjoy the cupcakes! Do you use the smart balance sticks or the tub? Hi Marina! I usually buy the Smart Balance tub because I can’t always find the sticks. Both work great for dairy-free baking. When you use the almond milk, do you still add the lemon juice/vinegar? Thanks! Hi Tara! Yes I still add the vinegar/lemon juice to the almond milk (or other dairy-free milk). I hope you enjoy the cupcakes! These are phenomenal! thank you for this recipe. I had a bunch of strawberries in my freezer from the Pick-Your-Own place that I picked last Spring; this recipe helped me to use some of them up. Keep up the good recipe work! Thank you so much Chris for the amazing 5-star recipe review! I am so happy that you enjoyed the strawberry cupcakes. I’ve never been strawberry picking, it sounds like fun and I bet you get the most delicious strawberries. Thank you so much for your kind words and encouragement!